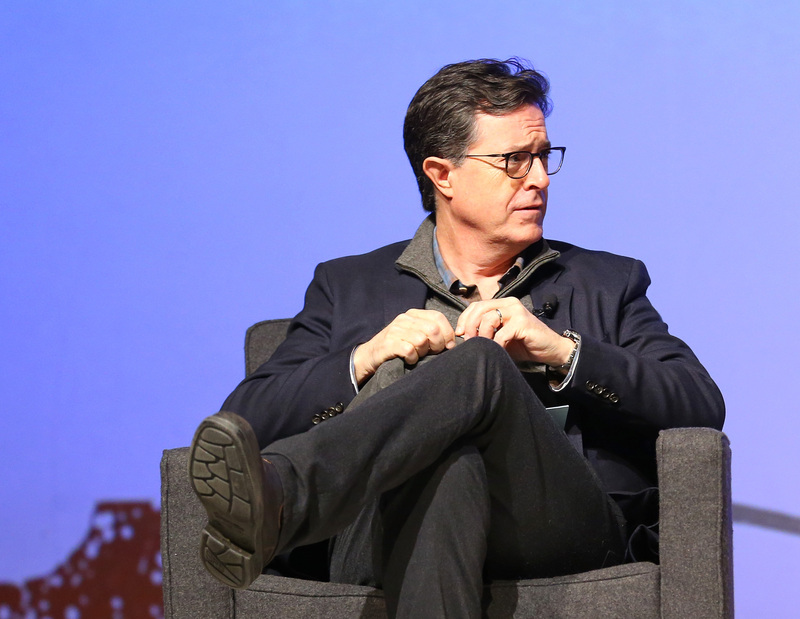 Although Stephen Colbert did his damnedest to keep everyone's spirits up during his live election special, it was only moderately successful. As the final results began to roll in, Colbert's election night special audience was somber, and the host got pretty serious, too. Oh, sure, we laughed. How could you not laugh at his enthusiasm and charm, as well as the enthusiasm and charm of his guests? How could you not laugh every time he delighted in getting to say the word f*ck on television? But there weren't as many laughs as you would expect the late night host to get and, in fact, one of the audience members even began crying as Donald Trump continued to lead Hillary Clinton in the polls. Hell, I'm crying just writing this, and the final results aren't even in yet. Seriously, guys, it was dead silent in the studio at times while Colbert was speaking. Usually, there's laughter and cheering, and he has to tell the audience to calm down and let him continue to speak. But as he spoke, people didn't say a word. There was no coughing, no movement, no chuckles. To quote Hamilton, in the eye of a hurricane, there is quiet. And I can't say I blame them. In fact, Colbert's sad speech in the middle of the special more or less summed it up. "Now, I think we can agree that this has been an absolutely exhausting, bruising election for everyone, and it has come to an ending that I did not imagine. We now all feel the way that Rudy Giuliani looks. Seeing this election, everyone's going to be saying has America lost its mind? And the answer is evidently 'back off buddy, we got 300 million guns, and we're kind of stressed right now,'" he said, keeping the tone of the speech lighthearted at first. But the elements for the words that were to come were already there, and they were painful. "By every metric, we are more divided than ever as a nation.... How did our politics get so poisonous? I think it's because we overdosed, especially this year. We drank too much of the poison. You take a little bit of it so you can hate the other side and it tastes kind of good and you like how it feels and there's a gentle high to the condemenation. And you know you're right, right? You know you're right." "Politics is a lot of horse race, and horse race is gambling, and gambling is according to the Bible a sin. Because it itself is a poison," he continued. "Worrying about winning and not what the consequences of winning is. And I think the people who designed our democracy didn't want us in it all the time. Informed, yes. Politicking all the time, I don't think so. Not divided that way... But now politics is everywhere and that takes up precious brain space we could be using to remember all the things we actually have in comon. So, whether your side won or lost, we don't have to do this sh*t for a while.